Criminal justice school in Indiana can prepare students for a range of interesting careers in law, protective or investigative services, environmental regulation and more. Legally speaking, statistics in the state may suggest promising career potential for aspiring criminal justice students. The number of court claims filed in Indiana's Courts of Record, City and Town Courts and County Small Claims Courts in 2013 was up 12.4 percent from 2004. The U.S. Department of Justice also reported a rise in violent crime in Indiana from 2010 to 2012. This may indicate a need for up-and-coming criminal justice professionals. Explore the different educational options offered at criminal justice schools in Indiana, find out which programs provide the best combination of value and education and learn more about the careers Indiana students are training for in law, the courts and fieldwork. After Criminal Justice School in Indiana: What's Next? For a more in-depth look at the criminal justice school options in Indiana, check out the school spotlight section below. With details on tuition cost, financial aid, student teacher ratio and student population stats listed in addition to more details on the school and program itself, these spotlights are intended to help students explore program possibilities. Every single instructor in the Ivy Tech Community College criminal justice program either is or was employed in the field in the real world. Special concentrations include corrections, youth services, law enforcement and forensics. The school stands out for its Emergency Response Training labs, which provide students with the opportunity to work with specialist field professionals like SWAT teams and other tactical groups. Graduates can immediately enter the workforce in a variety of unique settings, including school security, casino security and airport security. Ivy Tech has partnered with several four-year universities, which streamlines the process for transfer students seeking to pursue a full degree. The associate in applied science criminal justice degree from Ancilla College prepares graduates not just for careers in state, local and federal law enforcement, but also in private security. Other students may choose to use the degree to satisfy the first two years of a full degree at a four-year institution. There is also the option of a criminal justice certificate. Some students may be eligible for a scholarship offered by the Indiana Sheriff's Association. Students can participate in a wide range of clubs and activities on campus, and a campus ministry serves the spiritual needs of students and staff. At Vincennes University, students can pursue different degrees in the criminal justice field, like an associate in law enforcement, homeland security, and paralegal. Free in person tutoring is available to every student in every subject, as well as a writing center for writing specific help. For counseling help, students can go to the counseling center to openly talk about concerns, deal with personal feelings, and clarify goals. Many student multicultural clubs and organizations operate on campus to promote diversity, tolerance, and respect. The on-campus police department aims to provide a safe and secure campus for students at Vincennes University. Students who graduate from Indiana University Purdue University Indianapolis with a bachelor's degree in criminal justice will be able to pursue careers like federal law officer, attorney, and crime scene technician. The university also offers a master's program in criminal justice if students are interested in furthering their education. Many student run clubs and organizations are available for students to participate in, ranging from spiritual, to academic, to multicultural. To promote wellness on campus, the university offers intramural sports and fitness facilities for every student. Student health services are also provided on campus and include medical treatment for illness and injury, as well as counseling services. Trine University offers a bachelor's degree in criminal justice that teaches students practical knowledge and theory about the field and prepares them for careers. The program is also one of the only in the US to specialize in forensic and correctional psychology. Tutoring services are available to all students at the university in nearly every subject. To assist students in the job hunt, the Employment Resource Center offers resume advice, interview practice, and networking opportunities. Students can take advantage of opportunities to join clubs and organizations from skiing, to math, to anime, to add to their experience at Trine University. The criminal justice program at the University of Indianapolis offers a bachelor's degree in the field and prepares students for careers in law enforcement, corrections, or to continue to the master's program in applied sociology. The Student Health Center on campus provides free-for-service medical support for all students, including treatment for physical injuries, illnesses, and counseling for mental health. Free peer tutoring is available to every student through the Academic Success Center to provide academic support and guidance in almost every subject. Students can find resume and cover letter advice, help with the job hunt, and interview practice at the Professional Edge Center. Indiana Institute of Technology offers an associate degree in criminal justice, as well as bachelor's degrees in criminal justice specializing in administration, crime analysis, and rehabilitative services. In addition to traditional classroom learning, these programs are offered online, and as weekend and night classes to offer a more flexible schedule to those who need it. Tutoring is available to every student for free either in person or completely online. Students can also get involved in the many clubs and organizations on campus to enhance their experience. The Indiana Tech Wellness Clinic offers counseling services to students to ensure they stay healthy. 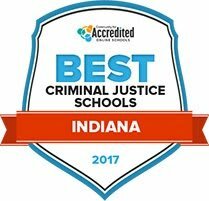 For a complete list of accredited criminal justice schools in Indiana, students can explore all their options with the following search tool. Before committing to a school, students should weigh all their options. Would a two-year program be a better fit than a four year? Which schools offer the right type of program or career specialization? Students can compare and contrast their choices by sorting categories like degree level, program cost, student population and more. Indiana employs nearly 75,000 people in the protective service and law industries. Students interested in attending criminal justice school in Indiana can check out the most popular criminal justice occupations in the state below to find out more information about the training they'll need to get these jobs after graduation. Students can also find employment numbers and average salaries for each job in Indiana specifically. Students exploring criminal justice school options in Indiana should have an idea about the career they want to pursue after graduation. Indiana offers a wide variety of professions within the criminal justice field, but it may be beneficial to see how the state compares with criminal justice professions nationally. Scrolling over the bars below will reveal job growth and salary data for each position in Indiana and nationally. Criminal justice students in Indiana can also note the degree requirements for each job to help select the appropriate training program. in Indiana may experience the challenge of finding a job sector that best suits them. The chart below details areas of Indiana and average number of employees and wage rates. Graduates can find what areas of the state will be most lucrative for their career. A professional organization dedicated to in-house legal counsel for businesses in Indiana. The group sponsors events, continuing education and provides a job posting network for members. As part of the offices of the Indiana Secretary of State, this division provides various services for businesses, including guides to starting and maintaining a business in Indiana. The ICC seeks to help new and established businesses prosper by offering useful information on advancing practices while maintaining legal and regulatory compliance. The Indiana Department of Labor provides resources for business owners and employees to be successful and compliant to all laws and regulations. A planning and development resource for small businesses in Indiana that also seeks to create a community in the state's business field. A community corrections organization made up of lawyers, legislators and criminal justice academics in the state of Indiana. Its goal is to enhance programs for those rehabilitated in the correctional system successfully re-enter the community. Providing resources for corrections, parole, probation, community based facilities, treatment centers and more, the ICJA's priority is to enhance training, professional development and educational opportunities in criminal justice in Indiana. This website has information about the current state of Indiana's correctional system, from local jails and prisons to audit reports and population surveys. They also address policy and procedures, as well as providing information on how to apply to work at Indiana's correctional facilities. The IJDA focuses on the detention, rehabilitation, and reintroduction of juveniles in Indiana. By sharing useful information and providing training opportunities with criminal justice professionals, IJDA promotes the well-being and legal rights for juveniles. A professional group for Circuit Court Clerks of Indiana. Learn more about becoming a clerk including details on their responsibilities and meetings. This website is a resource for finding all city, district, appellate, and supreme courts in Indiana, court records and personnel and job application information. A membership organization for court reporters, captioners, CART providers, court reporting students and instructors, proofreaders and scopists in Indiana. There is a section specifically dedicated to student advocacy. The Indiana Department of Justice page makes legal and judicial information available such as lawyer and personal rights in courts, resources for judicial assistance, and laws and regulations in Indiana. The Indiana branch of the ACLU provides Indiana citizens with information about local civil issues and how they can get involved with civil liberties cases. The ABA provides Indiana individuals with legal information for legal referrals, programs and other self-help resources. The Indiana Legal Services is a non-profit law firm working to provide legal assistance to low-income Indiana residents. Volunteer lawyers confidentially answer qualifying Indiana residents' legal questions at no charge. There are also links to other local legal resources. The Indianapolis Bar Association is a membership organization offering continuing legal education resources for Indianapolis lawyers and lawyer locating services for central Indiana residents. A group working to provide low-income central Indiana residents - specifically Boone, Hamilton, Hancock, Hendricks, Johnson, Marion, Morgan, and Shelby county residents - with legal aid in civil cases. The official website for Indianapolis’ police department, with information on laws and services, community news, public safety, courts and education and jobs. Professionals in this department work statewide to protect the public and provide law enforcement services. The website provides more information about these services as well as career opportunity information. A membership organization promoting better law enforcement tactics in Indiana and inspiring public support for state troopers. This website provides information on services in this division, which seeks to enhance, conserve and manage Indiana’s natural resources through law enforcement and licensing. This organization seeks to conserve, manage, and sustain Indiana’s wildlife and their habitats through education, advocacy and action. They have volunteer as well as employment opportunities. This department in the Indiana government works to inform the public about environmental issues facing Indiana residents, regulate pollution and assist businesses as well as individuals with environmental oversight and technical assistance. The Indiana National Park Service website provides information on the state’s national parks along with their conditions, history, maps, employment opportunities and visitation data.